Size: Select Size 4"x4" 6"x6"
Proximel® Non-Border Silicone Foam Dressing consists of a silicone wound contact layer, an absorbent foam layer and a film layer that is both waterproof and vapor permeable. Designed to encourage dynamic fluid management, the dressing's three layer construction provides an optimal, moist wound environment to promote faster healing and help reduce the risk of maceration. The absorbent foam layer provides superior absorption. The gentle silicone layer, which can be moved without lsoing its adherence, can also minimize pain and trauma to the wound and surrounding skin. 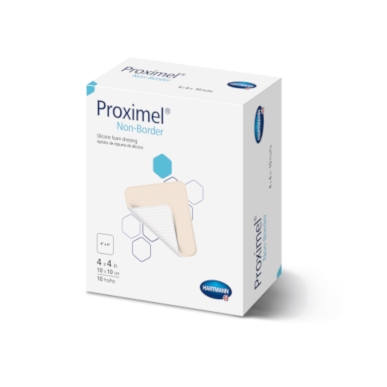 Indications: Proximel® Non-Border Silicone Foam Dressing is indicated for a wide range of wounds. From JannG of ARVADA, Colorado on 2/20/2019 . This is exactly what I was looking for! It's easy to use and can be cut into smaller sizes when necessary. The company drop shipping is fast too.